I'm really glad I decided to go see the Decemberists. Not the most amazing show I've seen, but definitely one of the funnest. The opening act for the band was a Scottish folk singer named Alasdair Roberts. He was a very good musician in his own right, but it seemed an odd choice for an opener. His music was very mellow and traditional, not anything exciting or loud, a harsh foil to the majority of what the Decemberists play. The crowd wasn't into it, and I think he mercifully cut his set short because of it. It's not that I hate solo acoustic balladry (case-in-point: my last post) it just seemed very out of place in this setting and for this particular demographic, most of whom would view this particular genre as music their incredibly un-hip parents would listen to. When the Decemberists took Promowest's stage, (replete with Japanese globe lamps and ornate crane-festooned backdrop) the night truly began. The set leaned heavily on material from their newly released album The Crane Wife, covering all essential tracks including the entire "Crane Wife" suite and prog-folk epic "The Island". The set also covered some past favorites such as "July, July! ", "Engine Driver", and the obligatory "16 Military Wives" which culminated in a sing-off between opposing sides of the venue. Another bout of audience participation was spurred when Colin Meloy organized a dance-off to the groove of "The Perfect Crime #2". The most exciting moment of the night was the performance of "Culling of the Fold", a song which didn't make it onto The Crane Wife. The majority of this song was sung by Meloy laying down on the stage and directed to my friend Mary Beth (the author of all those great video montages that accompany so many of my reviews, including this one), a gesture which left her quite flattered. The performance made it quite apparent that Meloy is a very masterful showman, one not afraid to take away a fan cell phone and personally sing the chorus of a song to a bewildered recipient. Comic relief was also provided by the incessant (good-natured?) bashing of label-mates Death Cab for Cutie, who are playing a show at Promowest on Monday. 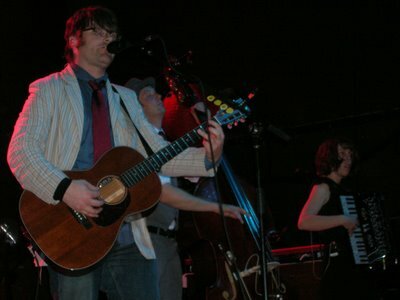 Musicianship was also played a large factor in the the overall impressiveness of the Decemberists' stage-craft. More obscure instruments such as the hurdy-gurdy and the bouzouki were employed to great effect with more than competent use of accordions and fiddles. The main set ended with the hurdy-gurdy drone of Crane Wife closer "Sons and Daughters", a topical song of hope which culminates in a crowd-wide chant of "hear the bombs fade away".